MARS gallery in Melbourne will be holding a small solo exhibition of Erin Coates’ print and video works The Pact throughout March. Featuring work by local and international artists, Obsession: Devil in the detail examines our fascination with the meticulous and micro, the real and the hyperreal and brings together a range of historical and contemporary works. On show at Mornington Peninsula Regional Gallery until 17 Feb.
Visit the successful crowdfunding campaign to learn more about this film project in development. Revelation Perth International Film Festival includes two of Coates' films in its 2019 Official Selection. The festival runs from July 5 - 18, 2018. Read more about the selected works here & here. Erin Coates is currently working on a multi-year project with artist Anna Nazzari titled Dark Water, which is supported by the Australia Council for the Arts. Dark Water will comprise of an interconnected installation, drawings, scrimshaw and a short film and will premier as a solo exhibition at Linden New Art, Melbourne, in May 2019. The Hiroshima Museum of Contemporary Art in Japan will be featuring Erin Coates' screen work Driving to the Ends of the Earth in their Video Art Program from January 16 through until the end of March. On Nov 9 Erin Coates was announced the Winner of the John Stringer Prize for 2017; a non-acquisitive prize awarded to one of six artists invited to create new work for the exhibition. The exhibition of the selected 2017 artists is on at the Kerry Stokes building, 30 Kings Park Drive till 23 Nov, open Mon to Fri, 9-5. Erin Coates is a selected artist for High Tide; the first incarnation of the Fremantle Biennale, a unique event, hosting the best in site-responsive art. 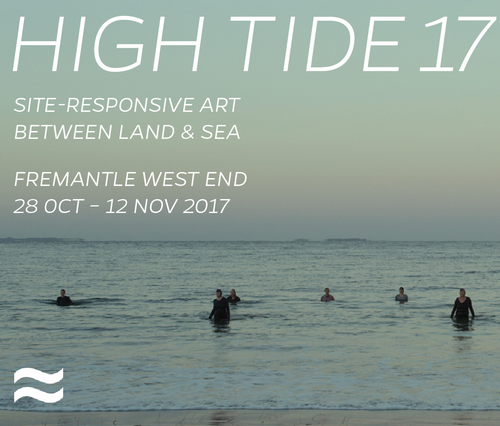 Situated in new and found sites around the west end of Fremantle, High Tide presents invited local and international artists who respond to and work with the rich landscape of Fremantle. Erin Coates has been selected for Channels Festival, a 10-day event of video art taking places in venues across Melbourne in September. Coates' work will be screened at Federation Square as a part of Conditional Surplus throughout the festival. Read more here. Coates is making work for a new commission by Decibel for the exhibition Sounding Art, to be held at PS Art Space in Fremantle in September. Decibel will be performing live compositions during the opening weekend, scored for each commission in the exhibition. Read more here. Coates' work is included in the upcoming exhibition Another Green World: the landscape of the 21st century, curated by Andrew Frost for the Western Plains Cultural Centre, Dubbo. Read more here. Two of Erin Coates' short films are official selections for the 20th Revelation Perth International Film Festival, taking place July 6 - 19, 2017. Read more here & here. Erin Coates and Anna Nazzari have their first collaborative solo exhibition in Perth at Moana Project Space, July 8 to 28, 2017. Read more here. Erin Coates was the guest artist for the Contemporary Film Program at the MCA throughout April, 2017. Each Saturday throughout the month selected works by Erin were shown in the MCA theatre alongside short films by other artists. Screenings included Q&A with invited guest speakers exploring the ideas and influences within each work. Coates' work was included in The National: New Australian Art, a major survey exhibition of contemporary art in Australia held across the Art Gallery of New South Wales (AGNSW), Carriageworks and the Museum of Contemporary Art Australia (MCA). Running March till June 2017. Erin Coates and Anna Nazzari showed new work in a solo exhibition at Firstdraft in Sydney, May 2017. Open Water: The Offering includes a new short film shot underwater and a connected series of scrimshaw. Erin Coates was selected as one of 14 finalists in the Guirguis New Art Prize, a national, biennial, acquisitive contemporary art exhibition and $20,000 prize. Administered by Federation University Australia, GNAP17 was shown at FedUni's Post Office Gallery and the Art Gallery of Ballarat and judged by Simon Maidment, Senior Curator, Contemporary Art, National Gallery of Victoria. Cetaphobia has made official selection for the Portuguese iteration of the 2016 International Festival Signes de Nuit.